Well this is a completely new style for me, I have played with fairies (I'm often away with the fairies - if you know what I mean), but I have never dabbled with fantasy. I shall have to keep this card for Ken cos it's his favourite genre of reading material and television watching, that mixed with sci-fi. This week we are sponsored by Stitchy Bear Stamps and you can find so many digital images and papers over at the Stitchy Bear and I Did It Creations Crafting Boutique. 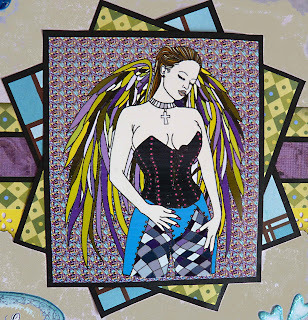 I chose to use one of my friend Stitchy's stamps called Dark Angel. She is just gorgeous and because of her name and the way she looks I chose to keep her on the dark side, but used some bright yellow, mauve, green and turquoise to lift it all. I really enjoyed experimenting with another new style. I have used Photoshop Elements again to colour in the image and printed it onto photo paper to get a more glossy effect. 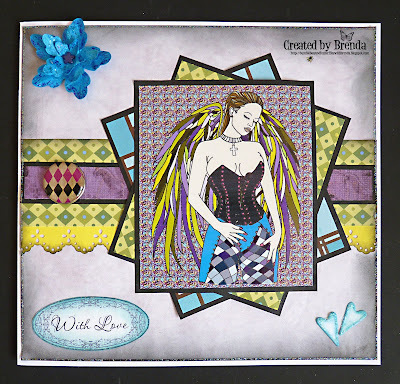 I used a sketch from Sweet Pea Stamps - I visited their blog to get a feel for how to approach this style. It's certainly different and for the first time I have used black soot for distress edging. I will welcome your comments, please give me the critical friend views, the good and the areas to develop, so that I can look to improve on what I am doing. Please go over to the MAWTT challenge blog to see what my team mates have been crearing for this fabulous challenge. Have a good end to the week, I shall be coming home tonight with Mum after we have been out for a meal. Ooh Brenda, this is dark but in a good way. I love it. It gives me ideas. Thank you. Your art is beutiful, I love how you colored this 'dark' lady. Your blog is inspiring. Amazing card Brenda, Lovely image and great layout.